At the start of the month Germany launched an escalated U-boat campaign, allowing the submarines to attack civilian ships without stopping to search them for contraband or give their occupants a chance to abandon ship. 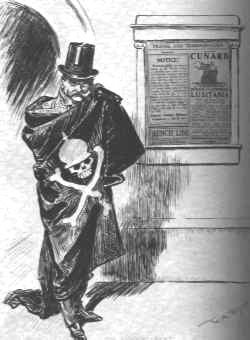 German leaders are aware that this risks war with the United States, but they have been persuaded by the memorandum of Admiral Holtzendorff, which projected that unrestricted submarine warfare will starve Britain into submission in a matter of months. This month U-boats have sunk just under 500,000 tons of enemy shipping, an increase of 50% on the previous month. The gains are impressive, though they are still short of what the navy had projected as necessary to defeat the British. It is also not entirely clear how much of the increase is due to the new tactics. The U-boats had started sailing through the English Channel late in January, which meant they had more time to spend on patrol. However German leaders remain confident. The U-boat campaign in the early part of this month had been somewhat restrained, to allow neutral shipping to escape the war zone around the British Isles. There will be no such restraint next month. The submarines will be completely off the leash and Britain will soon be on her knees. After the British crossed the Tigris upstream of Kut-al-Amara, the Turks abandoned the city and retreated towards Baghdad. The Turks withdrew in good order but they have been roughly treated by British gunboats that chased them up the river. Turkish troops isolated from their fellows have also suffered from the opportunistic attentions of local Arab tribesmen, who are always on the lookout for an opportunity for robbery and pillage. Maude, the British commander in Mesopotamia, knows that he has the upper hand in Mesopotamia. He wants to advance on Baghdad once he has gathered sufficient supplies, preventing the defeated Turks from consolidating their position. But he is under orders to avoid any further advance. He requests updated orders from London. Robertson, the Chief of Imperial General Staff, remains cautious. He fears that a rash advance by Maude could see his force over-extended. Above all, Robertson wants to avoid a defeat like that suffered by Townshend last year, when he was forced to surrender in Kut after an ill-judged attempt to march on Baghdad. So Maude is disappointed when Robertson’s orders arrive. He is allowed to push a small force in the direction of Baghdad and even to raid it with cavalry, but he is forbidden to advance on the city with his main force. The Laconia is a British ocean liner. Today she is approaching Fastnet, nearing the end of a journey across the Atlantic, when she is encountered by the U-50. The German U-boat fires a torpedo, which hits the ship but fails to sink her. So the Germans fire again and this time they have more luck, hitting the Laconia’s engine room and bringing her down. The Laconia’s passengers and crew abandon ship. Most survive, but 6 of the 73 passengers and another 6 of the 216 crew members are killed. Among the dead passengers are two American citizens, Mrs Mary Hoy and her daughter Elizabeth. The USA has already broken off diplomatic relations with Germany as a result of the escalated U-boat war. This attack can only heighten tensions between the two nations. Two days ago the British crossed the Tigris, upstream of Kut-al-Amara, forcing the Turks to abandon the city. Now the British return to Kut itself. British gunboats send a boarding party ashore to fly the Union Jack once more over the site of Townshend‘s humiliating surrender last year. It is unlikely that the townsfolk are too pleased to see the British back, remembering the horrors of the siege and the brutal reprisals that followed the British surrender. With Kut now secure the gunboats prepare to sail upstream, to harry the retreating Turks. Their blood is up now: perhaps this defeat can be turned into a rout that will secure British victory in Mesopotamia. Last year Britain suffered a humiliating defeat at Kut-al-Amara, where the Turks trapped a British army there and forced it to surrender. But now in Mesopotamia the fortunes of war appear to be once more favouring the British. They have received considerable reinforcements while Turkish numbers have been depleted by the need to send men to other fronts, notably Persia, the Caucasus and Palestine. Maude, the British commander, has resumed the offensive. 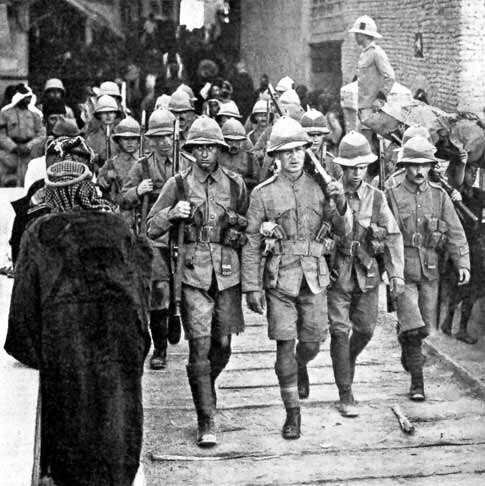 Fighting earlier this month appeared to be a replay of the failed attempts to raise the siege of Kut last year, with British attacks on strongly defended Turkish positions being repelled with heavy losses. But today Maude tries something else. While mounting diversionary attacks on the Turks at Sannaiyat and near Kut itself, he has a flanking force move upstream, where they manage cross the Tigris. Now the Turkish forces in Kut are in danger of being trapped. Rather than face the same fate as the British last year, Halil Pasha orders his men to retreat towards Baghdad. Kut is abandoned to the British. Germany and Austria-Hungary are having problems feeding their people. Before the war Germany was able to import food from overseas to feed its industrial workforce. Now the British navy cuts off the granaries of the world. Domestic food production has fallen, partly due to the agricultural labour force having been drafted into the army. The loss of fertilisers is also a factor. Germany can no longer import nitrates from Chile. What nitrates are available (largely thanks to the work of the gifted chemist Fritz Haber, who has developed a process for their synthesis) are being used to manufacture explosives. And the most recent potato harvest has failed, because copper is no longer available for the anti-blight sprays. Germans are now feeding themselves on turnips or Kriegsbrot, an unappetising bread substitute. The Allies meanwhile have further contributed to German food woes by buying up the entire output of the neutral states bordering the Reich. Thus the Germans are denied the cheese of the Netherlands or the fish of Scandinavia. Austria-Hungary should be in a better position, as a more agricultural country. However the situation here is worse. The authorities are less organised and regional politics compound the problems of food distribution. Prime Minister Tisza of Hungary is blocking food exports to Austria, feeling that his position is dependent on his people feeling that they are the best fed. As a result food is going very short in the cities of Austria, with starvation a real threat to many. In Germany the food situation is causing a breakdown of social solidarity. City folk grumble about farmers hoarding food, while country folk complain about ‘hamsters’, the urbanites who come out to the countryside looking for food to buy or steal. Within the cities, everyone complains that everyone else is getting more than they are. Traditional hierarchies are inverted, as manual workers in war industries are now receiving much larger rations than their middle class betters. Everyone complains about profiteers. In Austria-Hungary meanwhile the food crisis inflames ethnic antagonisms. Most worrying for the regimes in both countries, the food crisis in both countries leads to grumbling about the authorities, with people blaming the shortage of food on their government’s inadequate response to the problem. It is fear that this grumbling could lead to revolutionary unrest that has driven the German leadership to pursue their U-boat strategy, in the hope that this will be the last winter of the war. Allied shipping is under continuous danger of attack by German U-boats. However ships also face another danger: each other. In the early hours of the morning the Mendi, a British steamer carrying men from the South African Native Labour Corps is sailing through thick fog in the Channel when it is accidentally rammed by the much larger Darro, a British cargo ship. The Mendi sinks quickly. Although damaged, the Darro remains afloat, but her captain, Henry Stump, has her sail away as quickly as possible. She does not assist the survivors of the Mendi. The Brisk, a British destroyer, manages to rescue around 200 of the South Africans, but the loss of life from the incident is considerable. All 30 of the Mendi‘s crew lose their lives, as do 616 of the South Africans.